Marriage is amazing. It’s fun, exciting, blessed and such an adventure. Marriage is also hard. Blending two lives together, making tough decisions and navigating through all that life throws, is incredibly challenging. In the scheme of things, Collin and I’s four and a half year marriage is very short. But let me tell you, the tough stuff doesn’t wait until year ten or twenty. In our limited time as a married couple, we have already dealt with some tough stuff. Raising a little one really changes a marriage. Our life has become busier than ever, but also much more complete and full! One thing Collin and I noticed right away is that we have much less time just the two of us. After Nora was first born we never left her side. We were always with her and if she was asleep, she was in our arms or right beside us as we constantly checked her breathing. Or we were asleep ourselves! That didn’t bother us too much in the beginning because we were in the haze that is first time parenthood! As we got better and better at having a newborn we started to get the itch to spend some alone time together (and no, I don’t just mean in the bedroom). We wanted to go out, dress up nice, have dinner and not have to worry about if Nora was going to be fussy or not. We wanted to have a conversation that was not interrupted by cries or cleaning up spit-up. 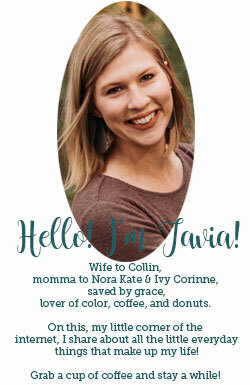 We needed time to just be Collin and Tavia, husband and wife, instead of mom and dad. Just for a little! We have adjusted and now have found time to go on dates and spend quality time alone after Nora goes to bed. But in this process we realized how important it truly is to the state of our marriage to date each other! When we first met and began dating we were always taking the time to go out for an evening just the two of us. We would dress up, pick a favorite restaurant, see a movie, and go to Target if I could convince him. Those are just the things you do when you first are falling in love. It’s easy to do it then because you have no one else to worry about but yourself! Once you’ve been married a while and kids come along you have to find a reliable babysitter, make sure everything is prepared, get home at a decent hour and then your kids are always in the back of your mind while you’re out. It just becomes so much more work and that can at times even discourage us from taking that time for each other. But during this phase of our marriage, I think making that time becomes even more important. We rarely have a conversation at home that isn’t interrupted with needing to change a poopy diaper, or stopping Nora from falling down. Forget cuddling on the couch if Nora is awake because one of us has to chase after her! Then, when she goes to sleep we have a list of things to do and we are exhausted! So, setting aside a time each month that we get a sitter, get out of the house and just enjoy one another is incredibly important! Date your spouse! It is dire that you keep your relationship a priority in the crazy years of raising little ones! Do you and your spouse have a special way you make time for each other? This is so true! Dating your spouse I’d necessary for a happy, healthy marriage. Great post! I’m going on 17 years, and I still feel like we have to work at connecting. Keep it up!